Mercenaries are the most common of the warrior professions and can be found just about anywhere. They learn few truly unique skills, sticking instead to the tried and true methods of combat. Don’t be fooled, however, into thinking them weak, for a skilled mercenary can be devastating in combat. Swashbucklers are sophisticated, witty, lightly-armed and -armored fighters who are usually found in the cities. They are the only profession that can truly handle the complexity of wielding two weapons at the same time. Experienced swashbucklers are so agile that they can even find ways of using an enemy’s strikes to their own advantage. The two-handed weapon style does have its down side though, especially the inability to use a shield effectively. Barbarians are uncivilized warriors who combine instinct, determination and sheer brute force into a formidable fighting style. Also called wildfighters, barbarians are healthier and feel the pain of wounds less than others. They are hard to surprise with any attack as their combat instincts never allow them to relax. Most barbarians view magic as a weakness and disapprove of its use. They do, however, have a special bond with shamans and will always accept the use of their spirit-gifted powers. Priests are the most common of the clerical vocations and exist in all but the most uncivilized kingdoms. They are not adept at physical combat, but priests receive spells from their god in compensation. Most of a priest’s spells involve healing or protection of some sort. Although a priest can be of any alignment, most tend toward good or neutral. Far too often, evil priests find themselves forced into a subservient role by the more offensive hellions. Paladins are the holy knights of the gods of goodness. They adhere strictly to the principled alignment and follow the ancient code of chivalry. Paladins are accomplished warriors and learn a number of combat techniques, but the true strength of the paladins lie in the spells they receive from their gods. Paladins can heal the sick and bless the faithful and they can gather important information about the world. Defensive spells are especially valuable to paladins. Paladins and hellions are mortal enemies, yet they do respect each others abilities, for they are two sides of the same coin. Hellions are the unholy knights of the gods of evil. They are always of aberrant alignment and follow their own code of twisted chivalry. Hellions are magnificent warriors and learn many useful combat techniques. The true strength of the hellions lie in the spells they receive from their gods. Hellions can call down sickness and disease upon the people, and their guile allows them to subvert otherwise good creatures. Furthermore, no one can escape to fight another day as well as a hellion. Hellions and paladins are mortal enemies, yet they do respect each others abilities, for they are two sides of the same coin. Shamans are the holy people of the barbarian tribes that roam the wilderness. They worship the spirits of their ancestors instead of the gods, but receive potent spells of both offensive and defensive natures for their devotion. The special powers of the shaman derive from their close contact with the spirit world, but their close contact with barbarians also strengthens their skills in the arts of war. Bards are charismatic performers of the highest quality. Lords and even kings have been known to employ particularly gifted bards. However, bards are not known only for their musical talent. A bard’s performance is an excellent cover for other types of covert activities. For this reason, a bard is usually a jack of all trades, with a knowledge of history and good combat skill as well as the powers of a magically infused voice. Rogues are the most common of the adventuring professions. They are weaker in straight combat than a warrior, but receive some compensations in other areas. Rogues are adept in the arts of theft and deception. The greatest ability of a rogue is his ability to strike unexpectedly while his opponent’s back is turned. Scouts are explorers skilled in woodlore and bush-fighting. They are valued for their ability to silently slip in, observe enemy formations and make it back to friendly soil to report. As much of their job requires them to be loners, scouts are very self-sufficient. They fight well and are adept at living off the land. Sorcerers are the most common of the wizardly professions, although they can be more scarce in uncivilized kingdoms. 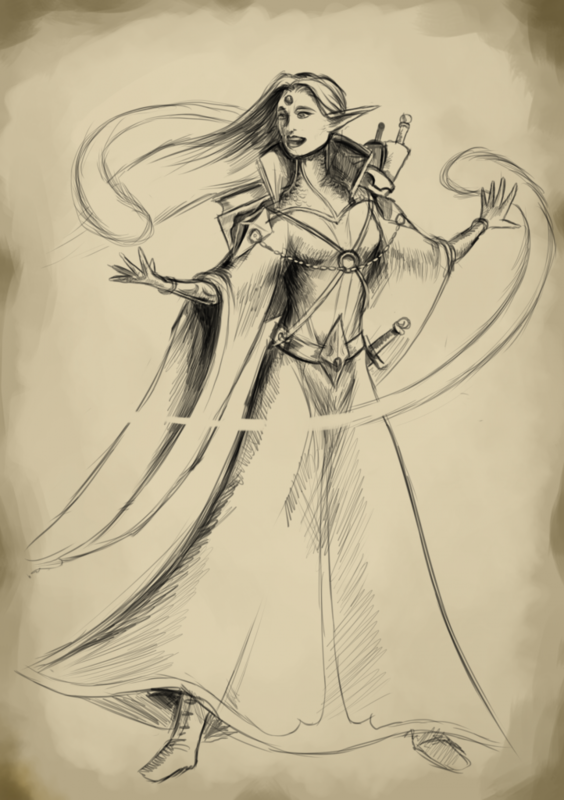 They are extremely weak in physical combat, but their spells are a must for any truly worthy group of adventurers. Sorcerers concentrate on those spells which affect the world and people around them. The attack spells that they do receive can be used to spectacular effect, and few can travel across the world as quickly as a sorcerer. Warlocks are the most untraditional of the wizardly professions, for in the truest sense they are not wizards at all. Yed, the elemental consciousness, grants warlocks their power; they magically harness earth, wind, fire and water. Warlocks wield great destructive power, but are often as great a danger to their friends as to their enemies. Necromancers are the masters of the undead and have great skill manipulating the draining energies of the negative material plane. These powers make them very powerful, able to raise up armies from the bodies of dead opponents and to warp space in hideous ways. Wielding these energies does have drawbacks, as they invariably cause a necromancer’s mind to become twisted and warped.